A website with just a few pages cannot tell your story completely, nor can it engage your potential and current customers with fresh content in real time. Blogging is more effective than any other medium at communicating your story in a timely and effective manner. That’s why this website has its own blog. Your website should too! The more relevant content you have up about your business, the greater the chance that people will find you via search engines. Of course, it’s possible to tailor your content so that you have an even better chance of being found online. Although blogs can be extremely effective at winning search, they are not magical search engine magnets. In the case of local markets with very little competition—quite a common scenario, actually—we’ve seen blogs produce excellent rankings almost immediately after going up. If, however, you are seeking high rankings for keywords attracting national competition, your blog will be just one element in your overall search engine optimization (SEO) strategy. No matter how readers find your blog—search engines, tweets, Facebook posts, or simply typing in your URL—once they come to your blog, they will find your content. 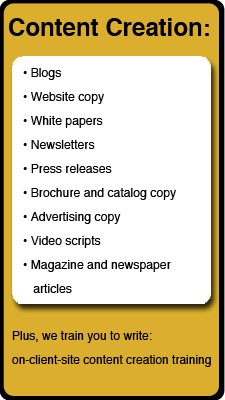 Just like a TV, radio, or print advertisement, this content exists to promote your business, your products and services, and you as the business owner. That’s why good content is so important—and why blogging is about much more than SEO. What do you want to say to your customers today? What will get them excited enough to choose you over the competition? How will you keep them coming back for more information in the future? As Marshall McLuhan said, “The medium is the message.” Your blog says a lot of positive things about you and your business. It says that you are in the 21st century and interested in using the latest tools to communicate with your customers. Putting up fresh blog posts about new products or recent accomplishments tells people that you are in the game. Continuously producing and making available quality content helps demonstrate that you care about quality in all dimensions of your business. When you blog, you verbalize the positive aspects of your business in a way that people can understand. You put your recent accomplishments down in words. You review the benefits of your products and services and keep them fresh in your mind. In other words, you are constantly providing yourself with training about how to talk effectively about your business. If your employees read your blog, they review these messages and also receive this benefit to an extent. If they blog themselves, all the better! Nearly every major company and brand today maintains a blog. Doesn’t your business deserve the same?